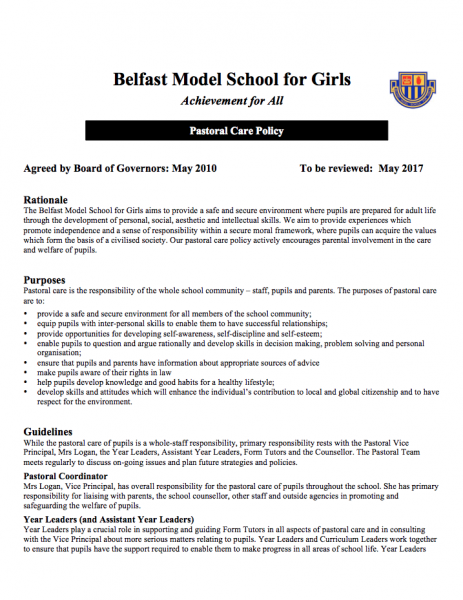 Pastoral Care in the Belfast Model School for Girls aims to support the welfare of every pupil. We feel it is important to provide a safe and secure environment and also to equip pupils to make informed decisions which affect their lives. An integrated approach of support and curriculum teaching aims to provide opportunities for pupils to develop self esteem and self discipline. As a Full Service Extended School we have strong partnerships with a range of community and other outside agencies who work with us to support our pupils and their families. You can view our full ‘Pastoral Care’ policy by clicking on the image below. View all of our school policies by clicking here.